Be part of the Arduino Day 2018 community event in Manila! Calling all user groups, makers, students, organizations, associations, teachers, pros, and newbies!. 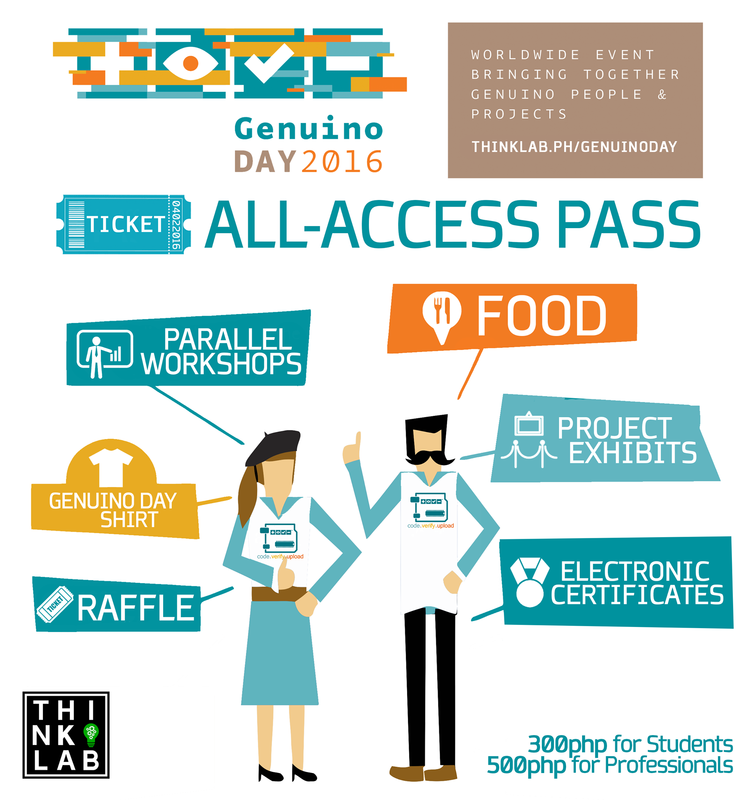 Thinklab is hosting our 4th Arduino Day Manila this year and we need you to make this the grandest Arduino birthday party to date! Cool! How can I be part of it? Project Exhibitor / Speaker – Bring your awesome Arduino projects for demo / show and tell. You will be required to submit a project description and photo/video demonstration of your project for screening. Sponsor – any sponsorship in cash or in kind is accepted. Provide give-aways or prizes for games and raffles, publicity materials, etc. Open to start-ups and entrepreneurs who want to feature their Arduino related products and services, you can have a booth or provide a talk/workshop during the event. Org partners – School organizations can be official org partners. Get free seats for your members and you can also help us get event sponsors. Others – do you wan’t to contribute to the event in any other way? Just let us know, we are open to your suggestions! You’ll also get a certificate of appreciation and cool freebies from our partners and sponsors, so what are you waiting for? Sign up now and be part of this awesome event!. You know you want to! Selected partners, project exhibitors and sponsors will receive an email confirmation from Thinklab, please give us a few days to review submissions before we can get back to you, thank you for your understanding. Contact us for more info. Join us in an Arduino Day 2018 community event in Manila this April 1 as part of a worldwide celebration of Arduino’s birthday! Everyone is invited: newbies, professionals, teachers, students, hobbyists, makers, etc. Feel free to join and participate! IMPORTANT: Please note that participants are required to confirm your slot by getting eventbrite tickets on or before March 31. On April 1, you are required to bring a proof of identification AND a copy of the eventbrite ticket. It can be a print out, or a digital copy on your phone/device. Make sure that the name on the ticket is the same as on your ID. Walk-ins may be allowed to enter but charged a Php100.00 walk-in fee, so make sure to register prior to the event to get the discounted rates. Registration starts at 12:00 nn, followed by a short welcome and briefing. Participants are requested to come on time. If you only want to attend specific talks/activities, you can do so. Only selected projects will be given a slot for Project Showcase sessions. You are still welcome to bring your Arduino projects, just let us know beforehand. There will be a freetalk and open session to give a chance to those who also want to share their projects or learnings about Arduino. All participants are expected to conduct themselves in a professional and courteous manner towards the community and their fellow participants during the event. Participants are responsible for the safety of their belongings & Arduino projects, the organizers will not be held liable for any loss or damage during the event. Unauthorized selling of any product or service inside the event venue. Only sponsors, official Arduino distributors, and sellers of Arduino compatible devices that have been authorized by the organizers are allowed to have a booth to sell Arduino related products/service. If you would like to be a sponsor please let us know. Networking activities that are not related to Arduino Day. Any activity that disrupts the flow of the program or cause inconvenience to the organizers/other participants. Any activity that cause damage to equipment, property, and/or project exhibits within the event premises. 1. How do I know if I have a slot for Arduino Day Manila? 2. Is the event for free? 3. I already signed up on WordPress but I did not receive an invitation via email. Can I still attend? 4. I received an invitation from Thinklab but something came up and I’m not sure if I can attend / I can no longer attend. What should I do? 5. Are walk-ins allowed on Arduino Day? 6. Are there ID requirements to enter the event? 7. What are my transport/parking options getting to the event? 8. What can/can’t I bring to the event? 9. Where can I contact the organizer with any questions? 10. Is my registration/ticket transferrable? 11. Do I have to bring my printed ticket to the event? 12. The name on the registration/ticket doesn’t match the attendee. Is that okay? You should receive Eventbrite tickets for the event whether you are a free pass holder, volunteer, or exhibitor . Tickets are limited and will serve as a stub for snacks, raffle, etc. If ticket ran out and you don’t get one, you will need to pay the walk-in fee of Php100. On April 1, you are required bring a proof of identification and a copy of the eventbrite ticket. It can be a print out, or a digital copy on your phone/device. Make sure that the name and email that appears on the ticket is the same as your ID. Please note that it is strictly one person per ticket. 2. Is the event for free?The event is 100% free for those who signed up for and have FREE PASSES tickets as well as to project exhibitors and volunteers. If you are not on the guestlist (no tickets and not registered) you are considered a walk-in participant, walk-in fee is Php100. Please follow up with secretariat@thinklab.com so we can send you invites. Or get your tickets directly at: EVENTBRITE If you have further clarifications regarding this, kindly contact us to confirm regarding attendance slots. If you no longer want to attend, unclaimed tickets will be given to others. If you were able to get a ticket but you can’t make it, please still notify us asap so others can go instead. If there’s an available space inside the venue and you are willing to pay the Php100.00 walk-in fee, you are more than willing to join us. 6. Are there ID requirements to enter the event?Yes, you are required to present an ID at the building lobby and for registration purposes. Students are required to bring their valid school ID and/or registration form. 7. What are my transport/parking options getting to the event?SparkLab Innovation Center has limited parking spaced, but you have the option to park on the side streets of Matahimik Street. 8. What can/can’t I bring to the event?You are welcome to bring your Arduino projects, just let us know beforehand. There will be a freetalk and open session to give a chance to those who also want to share their projects or learnings about Arduino. For safety purposes, projects with fire hazards, and hazardous parts and materials are not allowed inside the premises. Due to the limited space on the venue, projects that will be brought for live demo/showcase should be limited to the following dimensions:2x2ft. If your project exceeds that, we suggest that you show pictures/videos as demo instead. Please ensure that the name on the ticket is the same as on your ID. This will also serve as a stub for snacks, raffle, etc. Please bring a proof of identification AND a copy of the eventbrite ticket or confirmation email. Ticket can be a print out, or a digital copy on your phone/device. Make sure that the name on the ticket is the same as on your ID. This will also serve as a stub for snacks, raffle, etc. 12. The name on the registration/ticket doesn’t match the attendee. Is that okay?Make sure that the name on the ticket is the same as on your ID. This will also serve as a stub for snacks, raffle, etc. Join us in an Arduino Day 2017 community event in Manila this April 1 as part of a worldwide celebration of Arduino’s birthday! Everyone is invited: newbies, professionals, teachers, students, hobbyists, makers, etc. Feel free to join and participate! Please confirm your tickets on or before March 31, 2016. It will serve as your proof of registration, entrance ticket and food stub. On April 1, please bring a proof of identification AND a copy of the Eventbrite ticket (will be sent via email). It can be a print out, or a digital copy on your phone/device. Make sure that the name on the ticket is the same as on your ID. For students, please bring your school ID / registration form. Ticket will also serve as a stub for snacks, raffle, etc. We have been approved as a community organized event and is listed on the official Arduino Day event map! For details regarding the venue, program, etc. please visit the official Arduino Day 2017 Manila page. Be part of the Arduino Day 2017 community event in Manila! Calling all user groups, makers, students, organizations, associations, teachers, pros, and newbies!. Thinklab is hosting Arduino Day 2017 Manila again this year and we need you to make this the grandest Arduino birthday party to date! Project Exhibitor – Bring your awesome Arduino projects for demo / show and tell. You will be required to submit a project description and photo/video demonstration of your project for screening. Volunteer – Open to organizations and individuals. Be part of the registration team, ushers, event photographers, etc. You will be required to attend a pre-event briefing to qualify. Selected volunteers, project exhibitors and sponsors will receive an email confirmation from Thinklab, please give us a few days to review submissions before we can get back to you, thank you for your understanding. Contact us for more info. IMPORTANT: Please note that participants are required to confirm your slot by getting eventbrite tickets on or before March 15. On April 2, you are required to bring a proof of identification AND a copy of the eventbrite ticket. It can be a print out, or a digital copy on your phone/device. Make sure that the name on the ticket is the same as on your ID. For those who will avail the student rates, please bring your school ID and/or registration form. Ticket will also serve as a stub for snacks, raffle, etc. Walk-ins may be allowed to enter but charged a Php700.00 walk-in fee, so make sure to register prior to the event to get the discounted rates. Registration starts at 9:00 am, followed by a short welcome and briefing. Participants are requested to come on time. If you only want to attend specific talks/activities, you can do so. You should receive Eventbrite tickets for the event whether you are a free pass holder, all access pass holder, volunteer, or exhibitor . Tickets are limited and will serve as a stub for snacks, raffle, etc. If ticket ran out and you don’t get one, you will need to pay the walk-in fee of Php700. On April 2, you are required bring a proof of identification and a copy of the eventbrite ticket. It can be a print out, or a digital copy on your phone/device. Make sure that the name and email that appears on the ticket is the same as your ID. This will serve as a stub for snacks, raffle, etc. Please note that it is strictly one person per ticket. The event is 100% free for those who signed up for and have FREE PASSES tickets as well as to project exhibitors and volunteers. The Early bird fee for ALL-ACCESS PASS is Php 300 for Students and Php500 for Professionals. Students need to bring their School ID / registration form to avail of Student rates. If you are not on the guestlist (no tickets and not registered) you are considered a walk-in participant, walk-in fee is Php700. If there’s an available space inside the venue and you are willing to pay the Php700.00 walk-in fee, you are more than willing to join us, however, Genuino day shirts are not guaranteed. Yes, you are required to present an ID at the building lobby and for registration purposes. Students are required to bring their valid school ID and/orregistration form. You are welcome to bring your Arduino projects, just let us know beforehand. There will be a freetalk and open session to give a chance to those who also want to share their projects or learnings about Arduino. For safety purposes, projects with fire hazards, and hazardous parts and materials are not allowed inside the premises. Lunch will be provided but you can opt to bring your own food. Restaurants are also available in the building and nearby establishments. 10. Is my registration/ticket transferable? Make sure that the name on the ticket is the same as on your ID. This will also serve as a stub for snacks, raffle, etc. 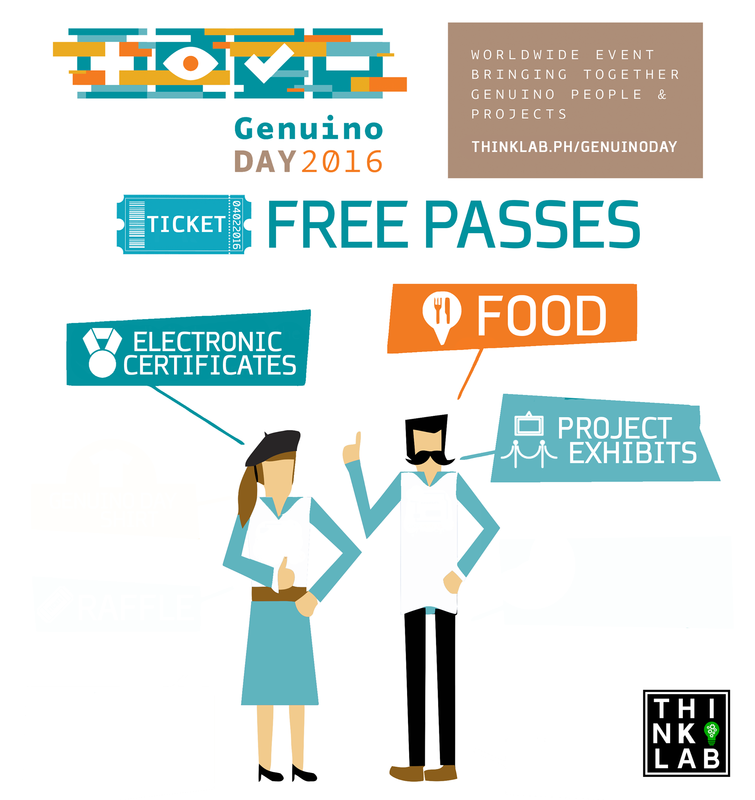 Join us in an Arduino (Genuino) Day 2016 community event in Manila this April 2 as part of a worldwide celebration of Arduino and Genuino’s birthday! Everyone is invited: newbies, professionals, teachers, students, hobbyists, makers, etc. Feel free to join and participate! If you want to contribute, you can sign up as a volunteer, project exhibitor, sponsor, etc. Or if you want to attend, please sign up below. All access pass – gives you entrance to whole day talks / events, access to view and try out cool Arduino projects showcased at the exhibitor booths, reserved seats to the afternoon parallel sessions (workshops/ seminars), Genuino Day shirt and lunch. Plus get a chance to get freebies and loot bags from our sponsors! Paypal payment accepted via our Eventbrite page! Please confirm your tickets on or before March 15, 2016. It will serve as your proof of registration, entrance ticket and food stub. On April 2, please bring a proof of identification AND a copy of the Eventbrite ticket (will be sent via email). It can be a print out, or a digital copy on your phone/device. Make sure that the name on the ticket is the same as on your ID. For students, please bring your school ID / registration form. Ticket will also serve as a stub for snacks, raffle, etc. REGISTRATION IS CLOSED (as of 12MN of 3/31/16). For details regarding the venue, program, etc. please visit the official Arduino Day 2015 Manila page.